Goose the Cat revealed as a Flerken, with glow-in-the-Dark Tesseract. Are you a cat lover? Or should we say, are you a Flerken lover? Wel if you answered yes to either one of those, we certainly have found the Pop! Vinyl for you... it's Flerken Goose from the new hit film Captain Marvel! 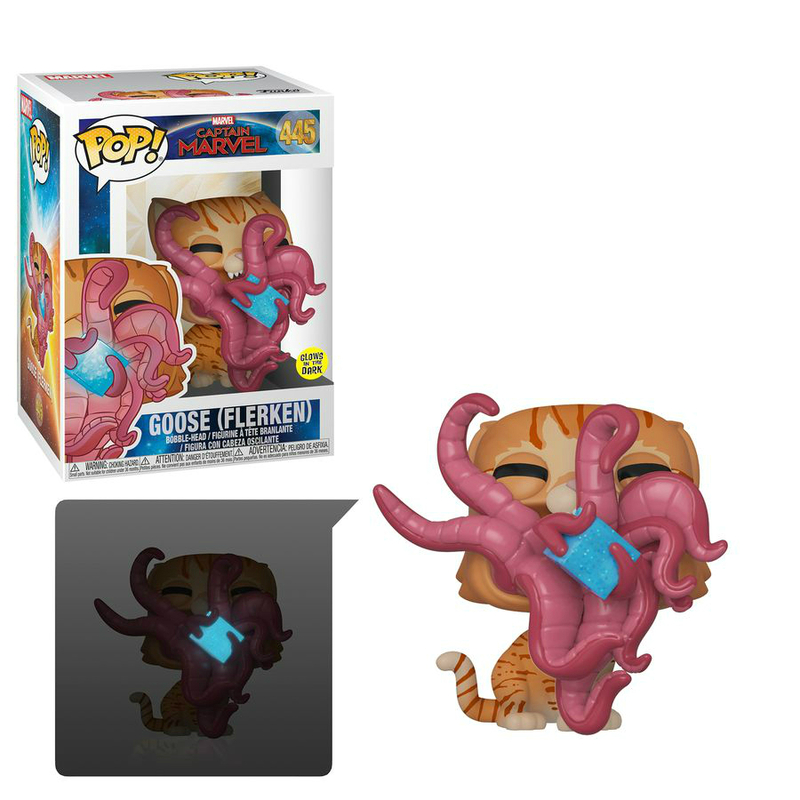 I know what you're thinking, that's not a cute little kitty, that's some tentacle-infested creature from another galaxy. Well don't judge a book by its cover, they all still purr the same when you stroke their back and feed them dinner. Set in 1995, the Captain Marvel follows Carol Danvers, a former U.S. Air Force fighter pilot, as she turns into one of the galaxy's mightiest heroes and joins Starforce, an elite Kree military team, before returning home with new questions about her past and identity when the Earth is caught in the center of a galactic conflict between two alien worlds. Here we have her beloved pet cat Goose (known in the comics as "Chewie"), who has revealed that she is in fact a Flerken herself. Goose is a character who has stolen the hearts of audiences around the world, so don't be surprised if we see her once again in the MCU. Also, the Tesseract Glows in the Dark! The purrfect addition to any Funko collection!